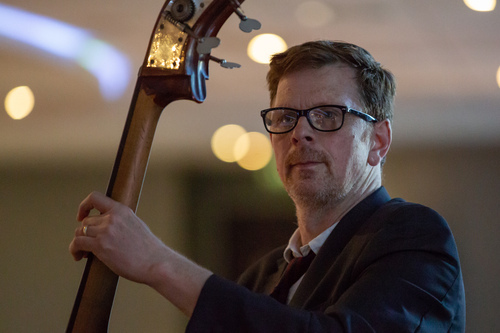 Stand by for an evening you just can’t miss – the wonderful Mark Edwards Trio on Thursday 20th June, starring Mark himself, Steve Thompson and Piers Clark. As pianist, composer, arranger and producer Mark has performed and recorded with numerous leading musicians including Art Themen, Johnny Dankworth, Don Weller, Scott Hamilton, Kern Peplowski and Liane Carroll, and he’s recently completed a 38-city tour of Europe with Katie Melua. On double bass, Steve, too, has performed with a wide and diverse range of musical talents, from Kenny Davern to Joe Locke and Tina May to Martin Drew. Much of his performing time is spent at Brighton’s Smalls Jazz Club where he has shared the stage with many of the world’s best mainstream musicians. Piers, specialising in the acoustic rhythm guitar style epitomised by Freddie Green and Steve Jordan, turned professional in 1987 and has worked in France, Spain, Belgium and Sweden, New York and the Middle East. When he’s in this country he runs weekly Jazz Workshop sessions on all instruments. It’s going to be quite an evening. If you’ve booked a holiday that week, change the dates and be sure to come and hear them!